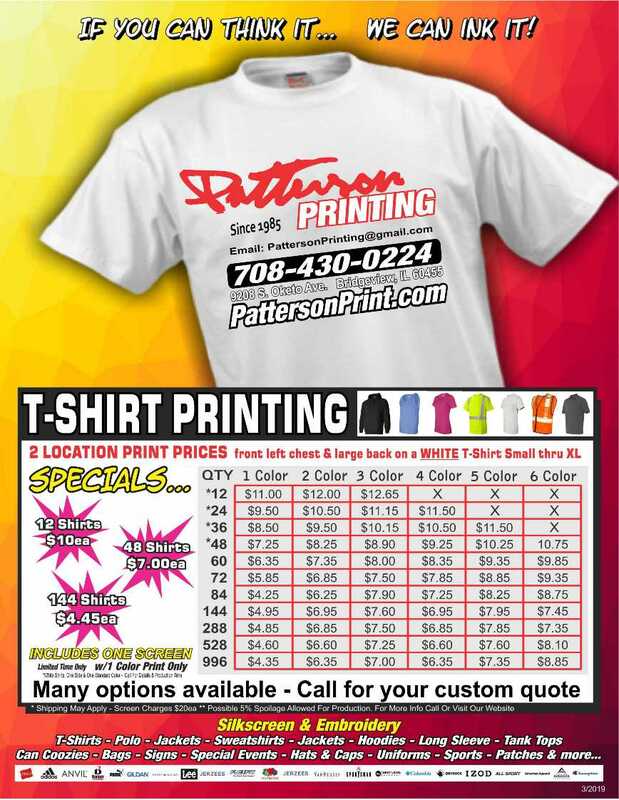 Patterson Printing - Bridgeview, IL. As the snow melts and the temps begin to rise, it can only mean one thing. Spring is in the air and that means T-Shirt season is upon us. While silk screen production seems to slow down over the Holidays and Winter season, it ramps up as soon as warm weather and Spring arrives. As the cold weather leaves and people get outside more, they realize they need t-shirts. It can be for a variety of things. It can be work related, it can be recreational related or anything in between. We can do any size order or any variation that you need. We can 12 shirts or 12,000 shirts. We can do T-shirts, tank tops, long sleeve, pullover sweatshirts, hoodies, jackets, bags, can coozies or more.